When is a Crazy Compass a memory quilt? Winifred Sherman used purples and lavenders from two piece suits presented to her husband when he traveled in Nigeria. 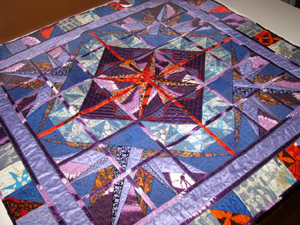 The center of the quilt is the Hoopsisters' Crazy Compass, now available on CD with quilt blocks made in the embroidery hoop. Formerly a block of the month project, the instructions and designs are now available to purchase. 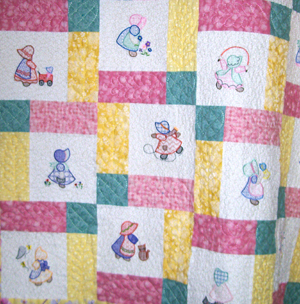 Winifred added the border with pieces of fabric from the center motif and others from memorable life events. What a beautiful way to preserve memories. 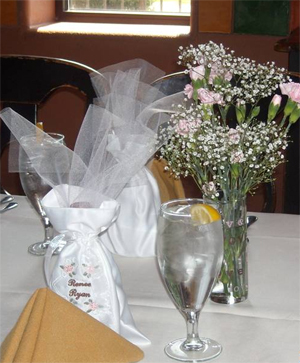 Embroidered favor bags graced the table when Shirley Koricich decorated for the briday shower honoring her daughter Renee. She surrounded the names of the wedding couple with little pink flowers embroidered on her Baby Lock. The white satin bags were finished with a rolled hem done on the serger. With dozens of bags to make Shirley was able to maximize her time by embroidering and serging at the same time. Donna Reiner combined hoop embroidery with free motion for this updated take on Sunbonnet Sue. The adorable little girls were appliqued in the embroidery hoop and surrounded with free motion stippling. The lattice of sashing strips is quilted with machine motifs. Cute and simple. 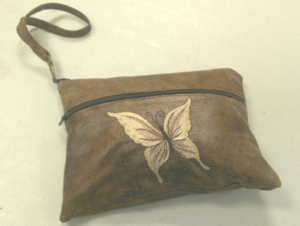 A butterfly on a faux leather zippered pouch. Is it a purse? A cosmetic bag? You decide. Rosemary Liebmann's butterfly bag draws questions and compliments for its elegant simplicity. Linda Chaney shares with us a trio of her recent projects, each with a different technique. 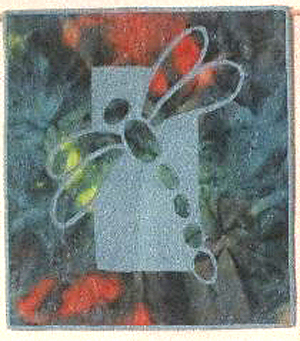 The dragonfly is needle-turned applique. This is her first hand quilted project. 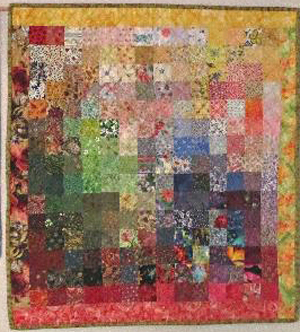 Here is Linda's charm quilt with 224 little pieces that are two-inch squares, shading from light to dark. Need something dramatic over the fireplace? 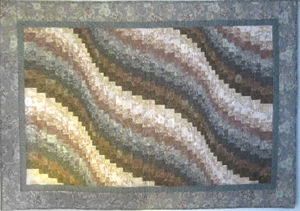 Linda Chaney's bargello fills the bill at her house. She says this was her first of this type and will be the ONLY one.